It’s hot in Almaty in August. It rose to 38°C over the last few days and today promised to be no exception. In T-shirts and shorts, SheWhoMustBeObeyed and I set out for a little known spot in the semi-desert NW of Almaty. Tamgaly (place of rock petroglyphs) is a UNESCO World Heritage site (http://whc.unesco.org/en/list/1145) of spectacular petroglyphs dating back to the Bronze Age, 1,300 – 1,400 years BCE. 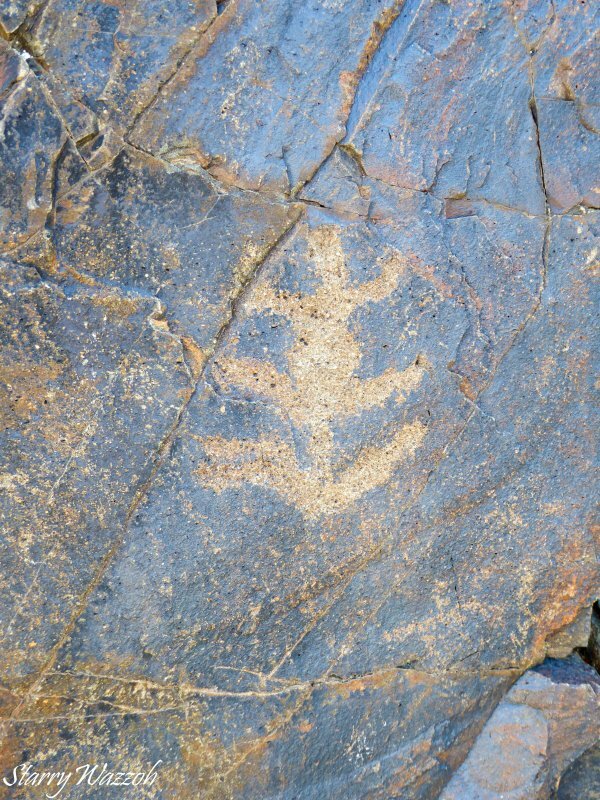 “Petroglyphs are pictogram and logogram images created by removing part of a rock surface by incising, picking, carving, or abrading” according to Wikipedia https://en.wikipedia.org/wiki/Petroglyph. ‘Tamgaly’ is the Russian version of the name, ‘Tanbaly’ the Kazakh version. 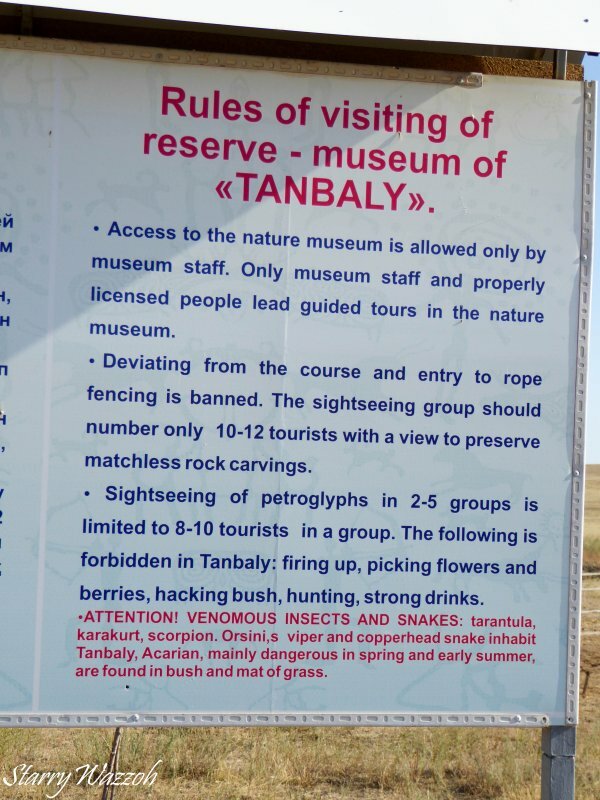 Wikipedia also tells us that “the name Tamgaly in Kazakh and other Turkic languages means ‘painted or marked place’.” https://en.wikipedia.org/wiki/Tamgaly. 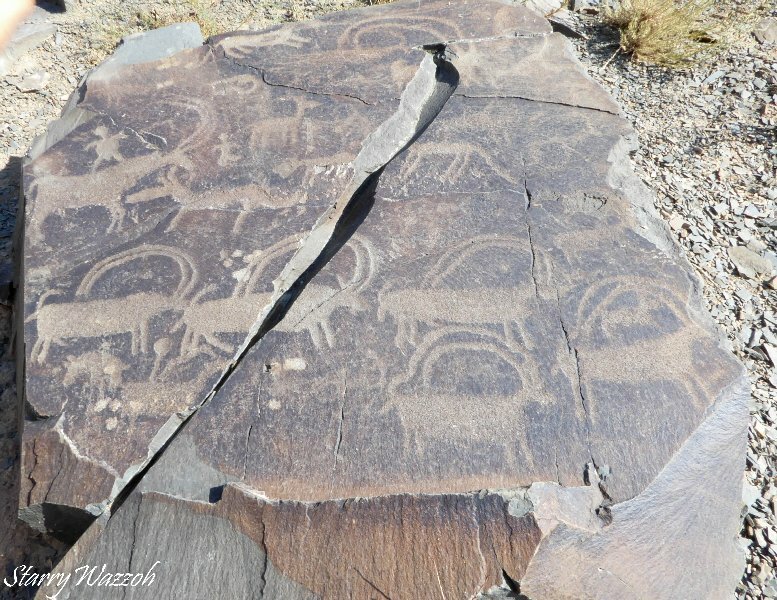 That’s handy because on the Ili River north of Almaty and 20km NW of Kapchagai are more petroglyphs, and that location is also known as Tamgaly, or sometimes Tamgaly Tas. 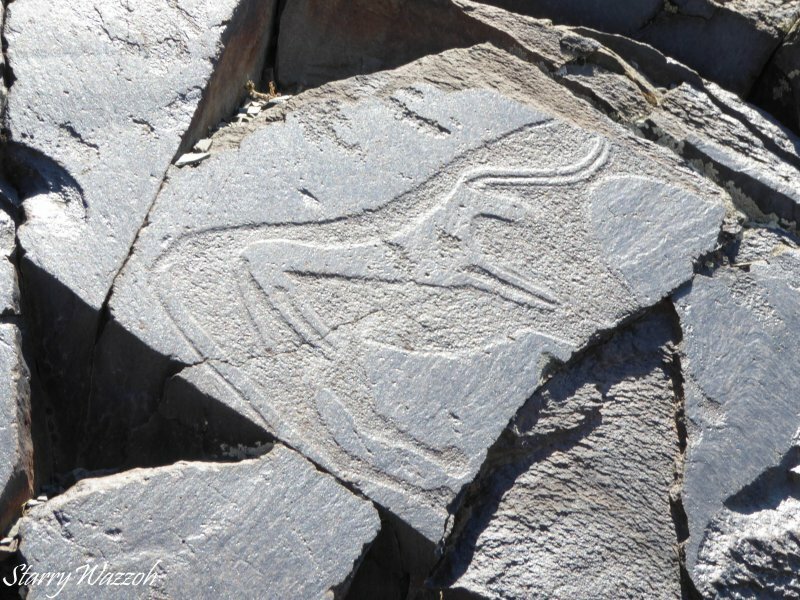 That Tamgaly dates back to 14th – 16th century CE and has Tibetan Script to admire and two magnificent Buddhist petroglyphs. More on this in an later post as that spot is also a favourite because a) it’s awesomely beautiful there, b) the sense of history is exceptional, and c) the birds all year round are stunning, especially in winter when the flowing river (in an otherwise frozen landscape) is alive with wintering wildfowl, the heavens alive with Golden and White-tailed Eagles feeding on said ducks and the cliffs harbouring attractive Wallcreepers with their dazzling purple wing patches. Best visited when few people are around though, as this is a popular picnic and vodka-swilling spot in good weather. That Tamgaly is so different from the Tamgaly we went to today. 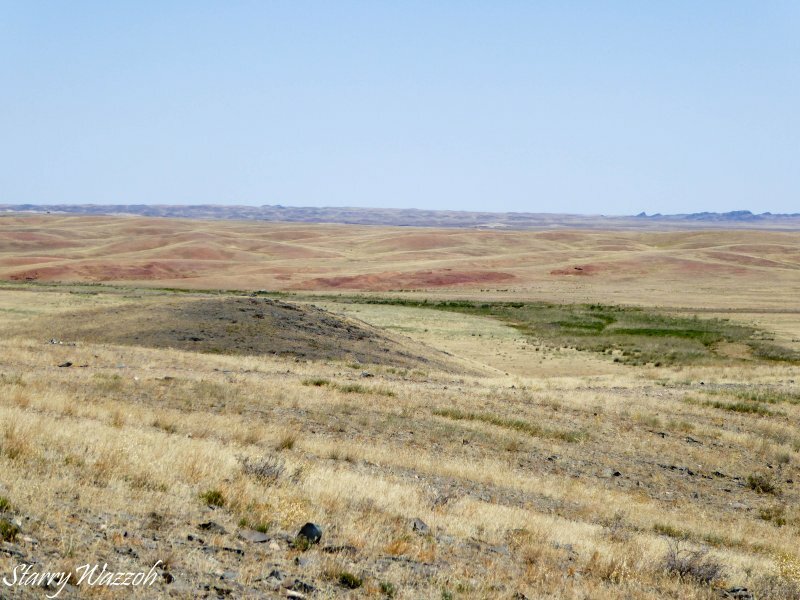 Remote, no river, rolling hills, semi-desert, quiet solitude and most happily, no people. And downright cool! T-shirts and shorts turned out to be ambitious and SWMBO swiftly employed our car rug to relieve her shivering. 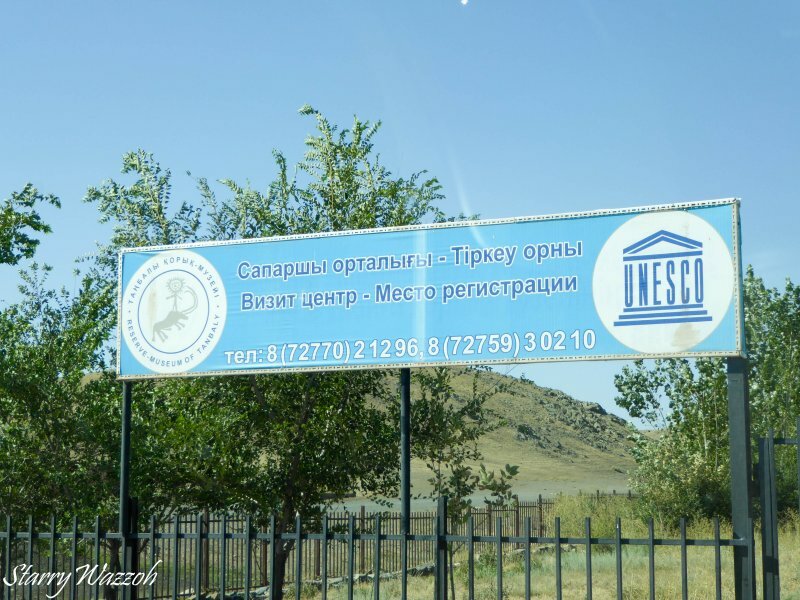 We learnt from prior research that the trip from Almaty, west for a couple of hundred kilometres along the main highway to Kyrgyzstan and Uzbekistan and then north for another hour on a rickety road to the site, would take two and a half hours without traffic. As we set off at 05.45 there was little traffic, but with a brief fuel stop, one stop to water the trees and another later to admire a roadside Short-toed (Snake) Eagle, it still took 3 hours. We passed 2 cars on this stretch of road – it must have been rush hour. 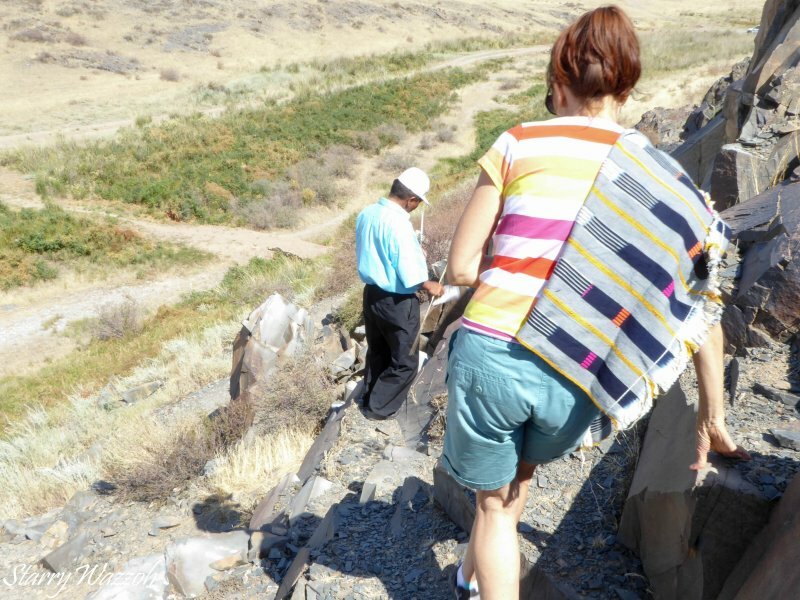 What our research failed to reveal was that access to the ravine with the petroglyphs is restricted and can only be visited with an official guide. In the nearby village of Karabastau, we spied a building hidden in trees in a fenced compound, the gates firmly shut. A sign clearly identified that this is the office for the site, but there was clearly no one around, not even in the guard hut outside the closed gate. The whole village was deathly quiet, not a soul in sight. We didn’t investigate further at the compound and probably should have taken the trouble to do that as it turned out. 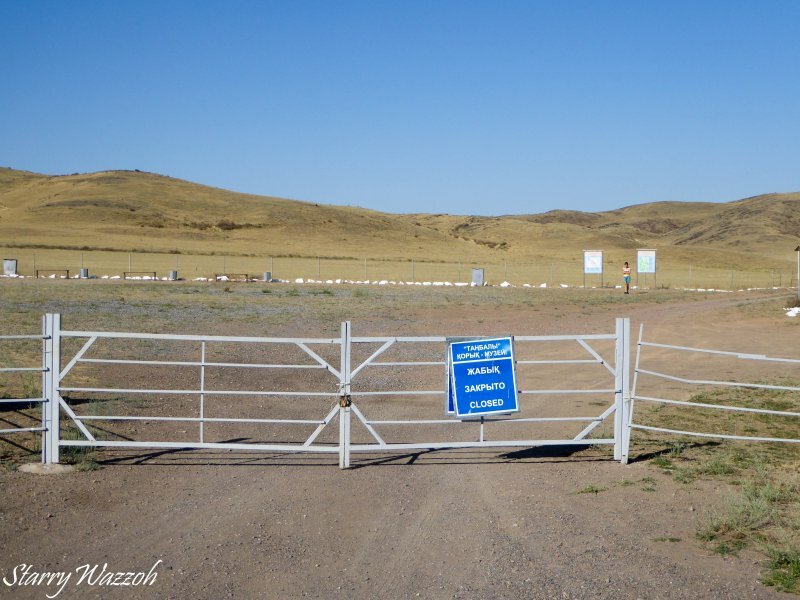 We knew the main entrance is a further kilometre to the north so we headed there only to discover a site entrance compound that was locked up tight too, although the low fence was easy to climb. 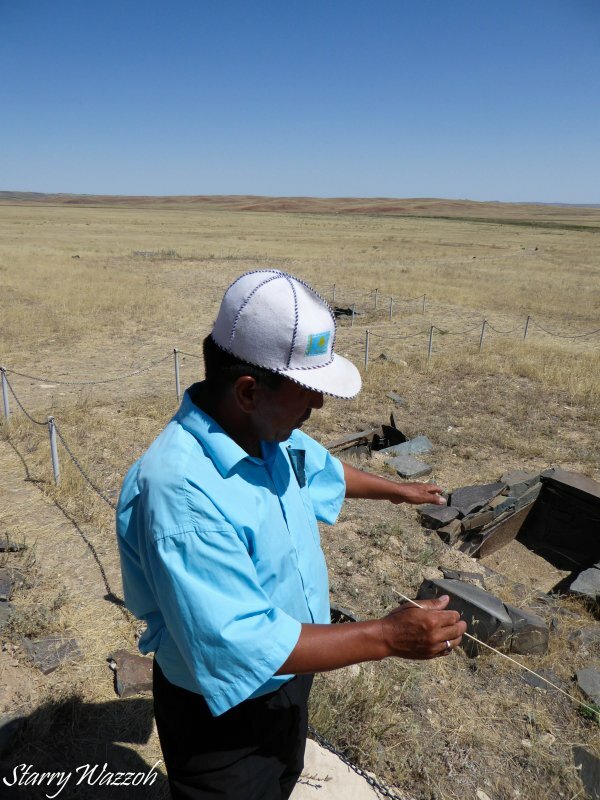 We checked out the trilingual notices (Kazakh, Russian and English) in the compound and learned that the site was now controlled and that for a visit we must be in the presence of a guide. What guide would that be? 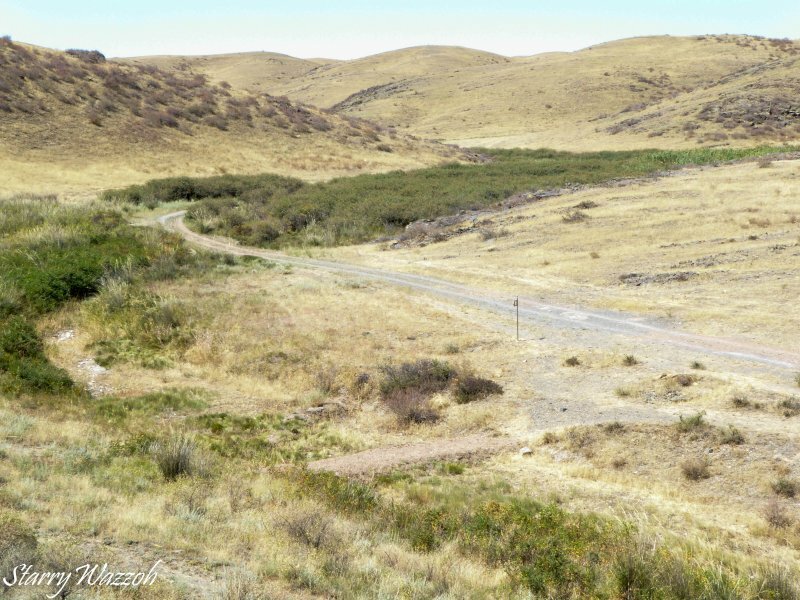 It was after 09.00 by this time so we explored further along the road (I was secretly hoping to find Little Bustards known to be in this location, but the little bustards were as hidden as the local populace). We walked about a bit at the Tamgaly River, just below the entrance compound, which must actually run at some time of the year, probably during the spring rains, and although there was nothing more than one small remaining shallow pool, that was enough to attract birds of all types including a marauding Marsh Harrier; the flora was also green and dense in the river course, unlike surrounding dry river beds, and this attracted a number of other smaller birds. We drove, walked around, admired ancient burial grounds and eventually made our way back to Karabastau in the hope of finding someone who may help us. It seemed pointless to drive for 3 hours and return empty handed so to speak. We stopped again at the compound at the village, but it still appeared to be closed with no-one in sight. It’s Sunday! Site-seeing day! Where are the guides? Where are all the visitors? Of course, Kazakhs tend to be late risers and usually venture out around lunchtime – maybe they would all appear later. Sightseeing in this region is best done before lunch, well before the crowds arrive. Karabastau is a very rural village, clearly with livestock its only source of income. Every homestead was a smallholding, difficult to differentiate in some cases which was the home and which was for the stock. A young boy darted between buildings in the distance but until SWMBO spied a substantial well-build home, possibly a guest house, we saw no one else. At the guest house (which turned out not to be), we saw labourers erecting what was possibly a large Kazakh-style covered area for guests. Of the three, only one had some Russian; they were probably Uzbek labourers and had no more clue than us about the treasure on their doorstep. We knocked several times but no one came at first. Not to be defeated, because she had seen a lady moving around within, SWMBO called out politely but persistently until a sleepy young male head poked out of an upstairs window and told us someone would be down. We had clearly woken the household but the lady of the house nevertheless good-naturedly pointed us in the direction of a small homestead two doors and 150 metres away. We left the car where it was and plodded off in the increasingly warm sun. In between the big house and our destination was what appeared to be an electricity sub-station but turned out to be a not very inviting shop. We gave that a miss. The homestead was a single story semi-detached, one side for the family and the other for the livestock. A young lady smilingly told us that yes, the Tamgaly guide does live there, but he is already at work. At the office, we asked. The one over the road? Да! We once more parked by the unoccupied security hut and checked the gate. Lo and behold, it was merely on a clasp and opened at a touch. Isn’t that what we should have done in the first place? Right! 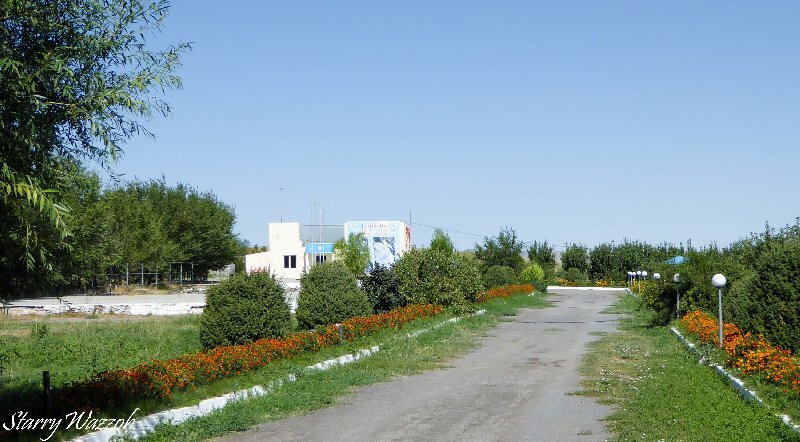 The building was hidden by trees – the only trees in the whole wide expanse of semi-desert – and beyond the trees, a long drive led to the building between colourful flower beds. Coming down the path to meet us was a Kazakh gentleman (presumably notified by his family somehow that strangers were in town – as I didn’t have a cell phone signal, presume landlines are the main comunicators) and after greetings and handshakes between me and him – the custom is that males never to shake hands with females in this part of the world – he cheerfully told us that he would guide us. Please could we wait while he went to get changed? He looked fine to us, but off he went anyway and returned hurriedly ten minutes later in his smart guide’s uniform, official shirt and felt cap. We climbed back into our vehicle and wended our way through the potholes back to the entrance compound, which he duly unlocked and motioned us in. Our guide, Nurakhan, is quietly-spoken, polite and very knowledgeable. We signed the book and drove a few hundred yards to a car park at the mouth of the ravine. 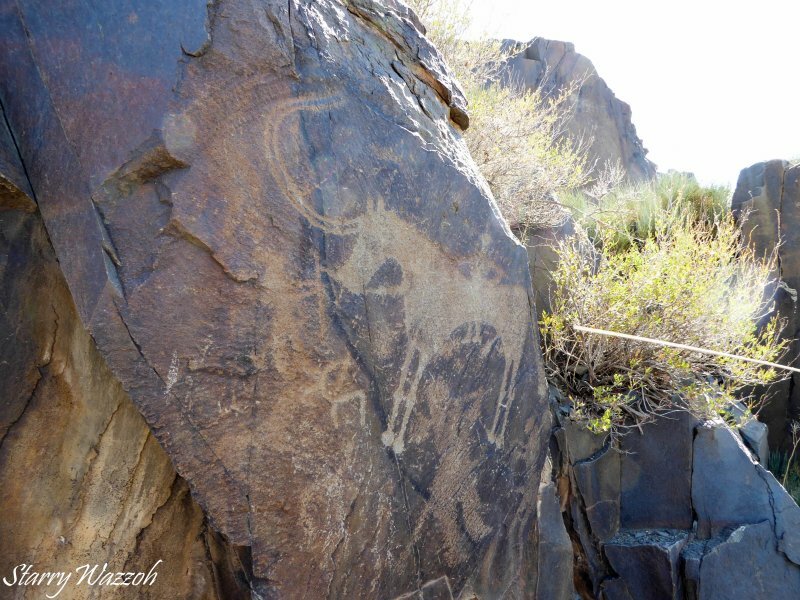 He patiently took us along a well-trodden route, quite safely hopping over boulders and scrambling up rock faces, to view the astounding petroglyphs. There are thousands of them and Nurakhan made sure that we saw all the interesting ones, including sun-headed gods, a woman giving birth, and, well, a couple doing what we humans have done for millennia. 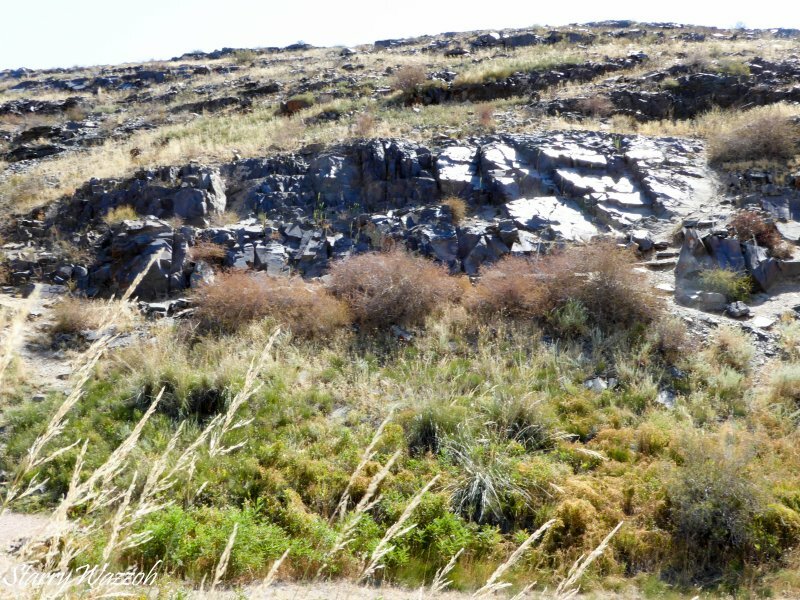 Below are photos some of the thousands of petroglyphs. Apart from these photos I’m not going to try to explain any further – read all about it on the website links above as this is much more informative – but suffice it to say, we were spellbound for a few hours as we covered the whole site, ending up at a burial ground, partly uncovered but mostly untouched. It was afternoon by the time the tour finished and our monetary contribution safely pocketed with a smile, and after a quick picnic, we set off on our long trip home to Almaty, stopping to water the same tree and to relax with milky black tea at a roadside ‘kafeci’ in Targap village. Even with traffic, it was only three and a half hours back to our home. By then temperatures had risen and the air-con was well-appreciated. What a day! What a site! What a privilege! We’ll be back. Next year, when it will be awesome (especially in spring when migration is in full swing). 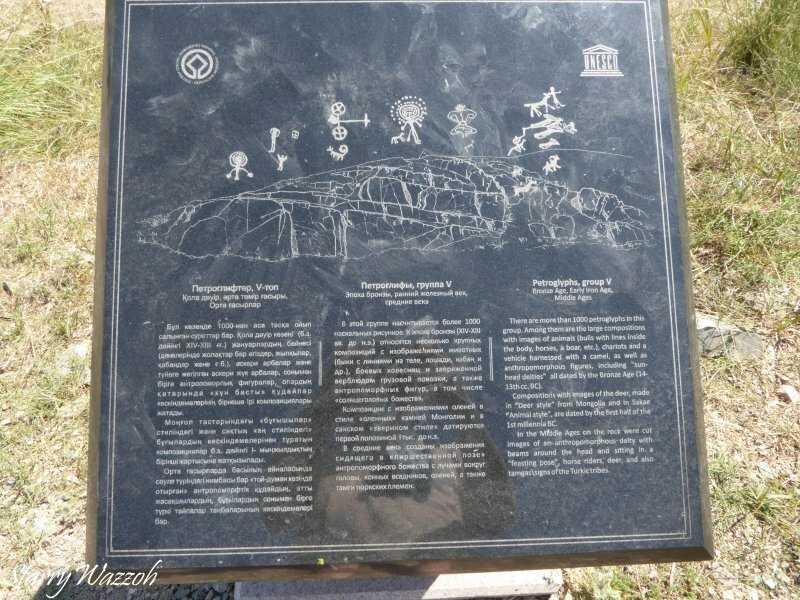 This entry was posted in Central Asia History and tagged Kazakhstan, Petroglyphs, Tamgaly, UNESCO, World Heritage. Bookmark the permalink. So glad you’ve made it to Tamgaly. It’s fascinating.